Matched betting is the process of getting free bets offered by bookmakers and turning those free bets into cash. Every bookie site have these offers and they give them out every day to entice new gamblers to place bets with them and to keep people betting. For example they will offer you a £10 free bet when you place a £25 free bet. 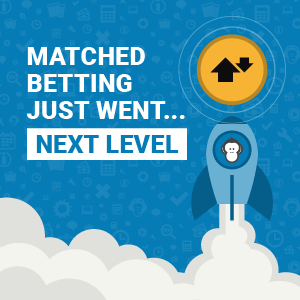 Matched betting means to place 2 bets on the same event. This is the bet you place with the bookie to qualify for the free bet. This is the bet you place with the exchange to nullify the back back. When the event is over you have won one bet and lost the other. So you have lost nothing and won nothing, but now we have a free bet! There is a little maths involved in this process but the online calculators and guides over at oddsmonkey will take care of that for you. For each free bet you earn you usually turn that bet into around 80% cash, so if you get a £10 free bet you can turn that into £8 cash quite easily. We can’t make 100% because there is commission to pay at the exchange and the difference in the odds makes it difficult to make more than this. It is possible but 70-80% is a good profit to aim for. There will also be a small loss (pennies) on your qualifying bet. There is no risk. You cannot lose any money following a matched betting course. The only time you will lose money is when mistakes are made. So in the early days especially you should take it slow and check all your bets and maths twice. Once you get the hand of it though you will be good to go. You can put as much or as little effort into this as you want. The more time you dedicate to it the more money you will make. Making £1000 a month from 1-2 hours a day is very achievable. Where does Oddsmonkey come in? Oddsmonkey is where you will optimise your time and therefore increase your profits. They find all the free bet offers for you and post them on the site every day. They also give you exact instructions on what to do in order to profit from the offer. So every day you simply sign on and then follow the instructions to start making money. It’s unlikely that bookies will ever stop offering free bets as they profit highly from all the mug punters. The bookies however aren’t keen on people exploiting the offers this way and they will stop offering you free bets if you do nothing but free bet offers. This is why we must place “mug bets” as well. This means to place bets on events that have no special offers or free bets attached to them. We still lay them off so we don;t lose any money but it keeps the bookies happy and keeps you making money for longer. Absolutely anyone! Even if you have never placed a bet before you can learn to do this. It’s very simple once you get started. It’s a great way to spend your spare time and a nice little hobby that can earn you a second tax free income. As long as you are over 18 and in the UK you can take part. I say in the UK as I am personally unaware of what is offered in other countries. So if you would like to learn how to do this and start earning some tax free money today, head over to Oddsmonkey and sign up for a free trial to get started.